Long before cell phones and the Internet, the first worldwide telecommunication web emerged in the 1800s with the invention of the telegraph and the telephone. By delivering information at the speed of electricity over wires that gradually stretched across the country and around the globe, these innovations created a network of opportunities for a rapidly expanding society. Alfred Vail made this key, believed to be from the first American telegraph line, as an improvement on Samuel Morse’s original transmitter. Vail helped Morse develop a practical system for sending and receiving coded electrical signals over a wire, which was successfully demonstrated in 1844. 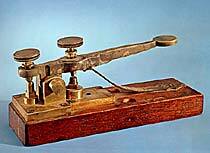 Morse’s telegraph marked the arrival of instant long-distance communication in America. The revolutionary technology excited the public imagination, inspiring predictions that the telegraph would bring about economic prosperity, national unity, and even world peace. In July 1876, Alexander Graham Bell demonstrated this experimental telephone at the Centennial Exhibition in Philadelphia to introduce his new invention to the world. Bell, a teacher of the deaf, drew on his studies of sound and speech to devise a method of transmitting voices over electrical wires. Unlike the telegraph, the telephone enabled people to communicate directly, without special skills or codes. First used as a business tool, after 1900 the telephone expanded into private homes and ultimately became a necessity of daily life. Printed in Morse code and transcribed by Samuel Morse himself, this message was transmitted from Baltimore to Washington, D.C., over the nation’s first long-distance telegraph line.